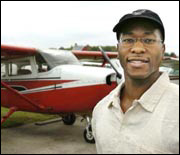 According to AOPA's e-Pilot Newsletter "a group of aviation enthusiasts, including a Tuskegee airman, has formed a nonprofit organization whose goal is to promote careers in aviation among African-Americans in the Greater Cincinnati community." The organization, called "Brown Condor", has raised $30,000 to date to help promote aviation in the African-American community in Cincinnati. The organization is named after John C. Robinson whose nickname is "The Brown Condor." He is well known for flying for the Ethiopian Air Force during an Italian invasion in 1935. Ethiopundit has a post about John C. Robinson and his involvement with the Ethiopian Air Force. The Cincinnati Enquirer explains that Brown Condor plans "to run aviation summer camps, visit schools and align itself with national organizations such as the Tuskegee Airmen and the Organization of Black Airline Pilots." The group purchased an interest in one of the Cessna 172s at the fixed based operator I use - Co-Op Aviation at Blue Ash Airport. Through the arrangement the program is able to offer students a $59/hour rate that includes the Cessna 172 wet and the insructor. This is a great rate as normally that would come out to just over $110. So far they have had eight pilots participate in the program including Eric Hill (right) who earned his license through the program. The plane they have partial interest in is one of the 172s I have been training on as of late. I hope to meet some of the team from Brown Condor while at the airport.